The story of Jackie Robinson’s entry into baseball, and the Brooklyn Dodgers in 1947, as told in the new film “42” by Brian Helgeland, makes one point about bullying and social combat above all others. People act like bigots because they believe they will treated as social inferiors by their own peers if they don’t. Once an inflection point is achieved in social prejudice, “it gets better” pretty fast. Rickey expected Jackie (Chadwick Boseman) to take up overcoming bigotry -- by turning the other cheek -- as his own special sacrifice and challenge. Most of the time he did. He preceded Rosa Parks, and so did his wife Rachel (Nicole Beharie). It makes another libertarian point. Eliminating prejudice is good business. Branch Rickey (Harrison Ford) decided, right after World War II, that he wanted African American players because hiring them would give him a competitive edge over other teams. “Green” (money) doesn’t know race. Groupthink was dangerous at first. On their first road trip, in 1947, the Dodgers would find that their hotel in Philadelphia (the “city of brotherly love”) l refused to put up the team because of one black player. The film also shows how Jackie’s aggressive baserunning could take advantage of opponent’s (especially pitchers’) distractions. The suspension of Leo Durocher (Christopher Meloni) for having a mistress adds to the curious contradictions in the mores of the times. The shower scene has some visual anomalies. And the script makes points that anticipate the course of some of the debate on gays in the military to occur almost fifty years later. Remember, Truman integrated the military in 1948 (one year after the time period of this film), as demonstrated in the HBO film “Truman”. The film recreates the old National League ballparks well. I don’t know how it was done. But besides Ebbets Field in Brooklyn (with its 297 foot right filed line and slanted wall), it shows the Polo Grounds in Manhattan, Forbes Field in Pittsburg, Crosley Field in Cincinnati, and Sportmans Park in St. Louis. The film has other technical inaccuracies, though. There were no insterstate highways in 1946. And in the climactic scene where Robinson hits a home run in Pittsburg (a long shot there), “Dem Bums” were on the road and had to survive the bottom of the ninth. The official site from Warner Brothers and Legendary Pictures is here. Both companies used their musical trademarks this time. The film points out the "42" is the only MLB uniform number completely retired. In Cincinnati at one point, Pee Wee Reese (Lucas Black), puts his arm around Robinson and says, "Maybe we can all wear the number 42 so no one can tell us apart." I saw the film at the Regal in Arlington VA Friday afternoon in a small auditorium, with a fair crowd for a weekday, on the opening day. I started following MLB in 1953 at the age of 10. By that time, black players were common. I recall Larry Doby or the Cleveland Indians and Minnie Minoso of the Chicago White Sox. I can't recall black players on the Washington Senators during that period. 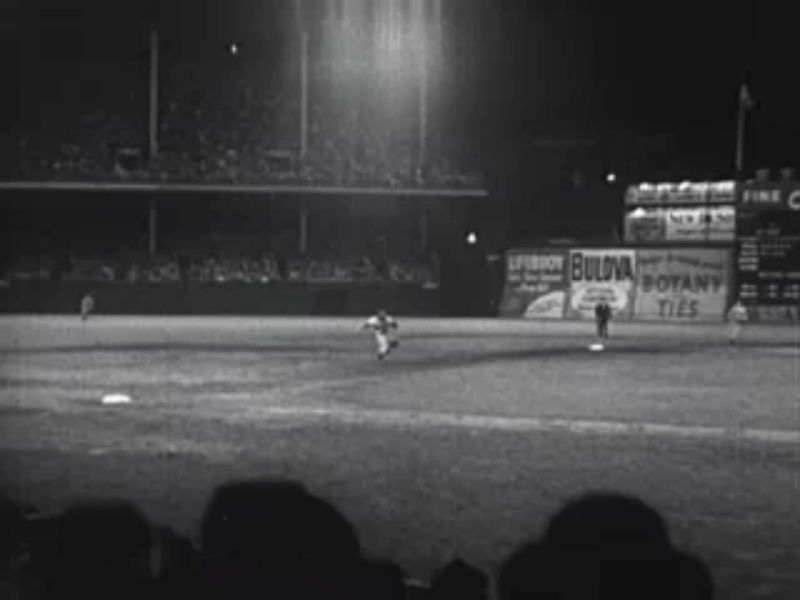 Wikipedia attribution link for picture of game at Ebbets Field in 1950. At First Baptist, Washinton DC, pastor Julie Pennington-Russell treated Jackie's performance as an example of how to turn the other cheek, and the team knew it needed him to do this.